The Excel Organizational Chart Template (Organization Chart Maker) allows the automatic generation of organizational charts from plain tabular data formats. Organizational source data can be from existing ERP and human resource management systems such as PeopleSoft, SAP and Microsoft Dynamics. A variety of options are provided for customizing formatting and content based on hierarchical relationship rules. Automatically create the hierarchy organization charts as structures change and are updated in backend HR systems. Create multiple organizational charts from the same source data based on different rules specified for partial or full data. Apply customized color coding based on defined organization levels. 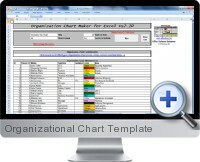 Organizational charts can be output into a new and professional looking workbook for publishing or distribution. Color coding can be based on additional data attributes such as creating heat maps for staff performance or any other measure. Organizational charts are not limited to human resource structures and the Excel template can process any data type suitable for hierarchical structure display. Common applications of organizational charting include visualization the relations and breakdowns for asset portfolios, share ownership, web site navigation or any type of data with a parent-child relational structure.